Corruption has always been one of the biggest obstructions in between of the work. However, you cannot prevent it by any means. Similarly, users of SQLite database face multiple errors due to this corruption. One of the frequent issue is SQLite database disk image is malformed. In case, you are accessing your SQLite database more often, then the chances of the SQLite data to get corrupted are huge. The main reason behind this issue is the bugs within the database and hardware failure. Once get damaged, it is not as easy as it seems to be to fix this issue. Considering this, we have come up with this blog. Here, we will not only enlighten users about the method to rectify SQLite database disk image is malformed. But, the reasons behind the occurrence of this issue. Damaged in the SQLite files results in the corruption of entire database and creates a problematic situation for users. In case, a user try to open a non-SQLite file in the SQLite database, then most probably this error occurs. As the matter of fact, that SQLite is an ordinary disk file. Then, any process can open it without any issue and overwrite it with the junk characters. This results in the unnecessary modifications in the database. Most of the applications consist of some internal bugs. Even the SQLite database programs have some minor bugs that may result in the error code. Another reason is the failure in disk drive/ flash memory. It can happen into the content of the file and result in corruption. Moreover, in such situation, it becomes tough to resolve this issue. There are some in-built utilities, which are designed for data protections. However, at times these protections are not enabled because of configuration options. Subsequently, the error occurs in SQLite. Then, choose objects you wish to migrate on the dialog box of Export SQL… Apart from this, define some other options too. Finally, with this step, you can repair the SQLite database and can simply open it. If the problem is still the same, then you have to use a third party tool. Now, the question is how to choose a perfect utility among all the other tools that are available in the online market. 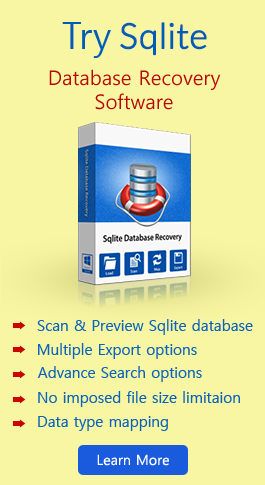 Sqlite Recovery is one of the trustworthy and popular software among different organisations. It has the ability to repair as well as export corrupt .db SQLite file without any issues. Apart from this, it does not have file size restrictions and keeps the data safe throughout the whole procedure. In the above blog, we have learned about SQLite database disk image is malformed, this error. Sometimes it becomes very tough to resolve this issue form SQLite and the reason behind this is unawareness about the root cause behind the error code. Therefore, along with the manual workaround, we have also discussed a third party tool. Users can pick any of these methods and accomplish their task.